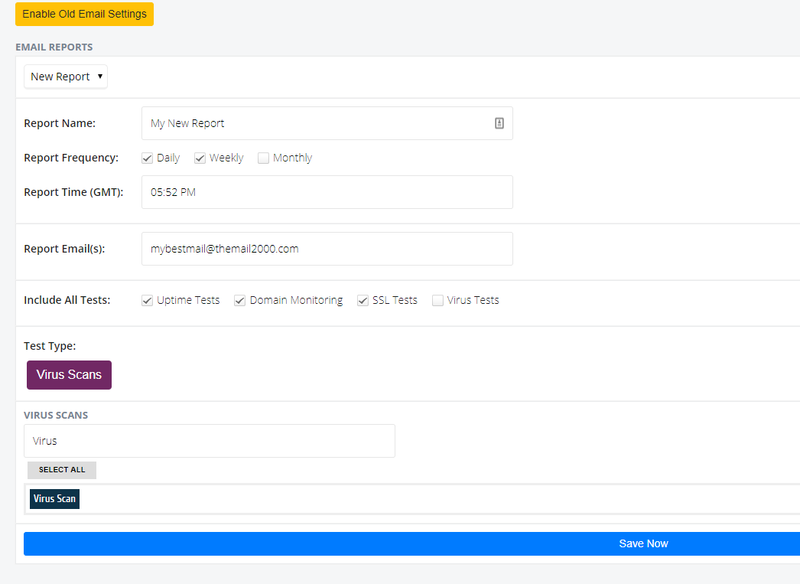 With the release of our new and enhanced Email Monitoring feature it’s now possible to send more versatile and customised reports out to your team or clients. For users who have previously set up email reporting with our old system – the old settings will still be fully available. In this article we will take you through how to switch between the old and new reporting configuration. The old legacy reports will be available only for those who have utilised them in the past, for anyone who did not do so – only the new email reporting shown below will be available. Old email reporting has a single simple function of automating daily, weekly and monthly reports to go out at a time chosen by the user. These reports will be sent for all tests on the account, up to a limit of 300 individual entries. You can now include other test types in the report, so you are not purely limited to uptime tests. You can send reports that include specific tests, rather than all tests, making tailored reporting possible. You will benefit from an updated layout which will improve the look and feel of your reports. To switch from the new email report back to the old one, you can use the “Enable Old Email Settings” button in yellow at the top of the page. Please note that only 1 email report type can be active at one time, so enabling one would effectively disable the other.